Julian’s interest in the ocean began when he moved to the North Sea in Germany at age 7. 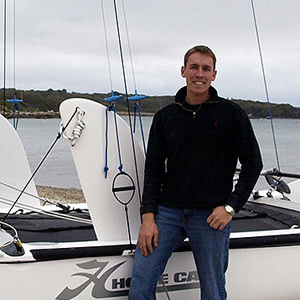 To combine his interest in physics, statistics and computers with his passion for the ocean, he started studying Oceanography at the National Oceanography Centre at the University of Southampton, and completed his undergraduate degree as Master of Oceanography in 2007. His master’s thesis entitled “Large-scale Ocean Circulation in the Southwest Indian Ocean from Satellite-Derived Gravity and Altimetry” focused on the combination of satellite remote sensing and physical oceanography. He continued his education at the Massachusetts Institute of Technology – Woods Hole Oceanographic Institution Joint Program with his Ph.D. advisor, Dr. Raymond Schmitt. In 2012 he successfully defended his Ph.D. thesis “The Production of Temperature and Salinity Variance and Covariance: Implications for Mixing”. Julian continued working with Raymond Schmitt as a Postdoc at the Woods Hole Oceanographic Institution until joining ESR in July 2013. At ESR, Julian is continuing to combine his interest in satellite remote sensing techniques with traditional physical oceanography, in projects involving Aquarius, air-sea fluxes, mixing in the ocean and an in-situ surface salinity analyzer (dubbed the “sea-snake”).